We have so many great events happening all year long. You can view photos from our events in the gallery below. The meeting was opened with the presentation of colors by members of Boy Scout Troop 6. As an added treat, Eagle Scouts Calvin Eng and Max Lunifeld played a violin/cello duet of the National Anthem. ACMNA hosted its 32nd Annual Meeting at Prince of Peace Lutheran Church. 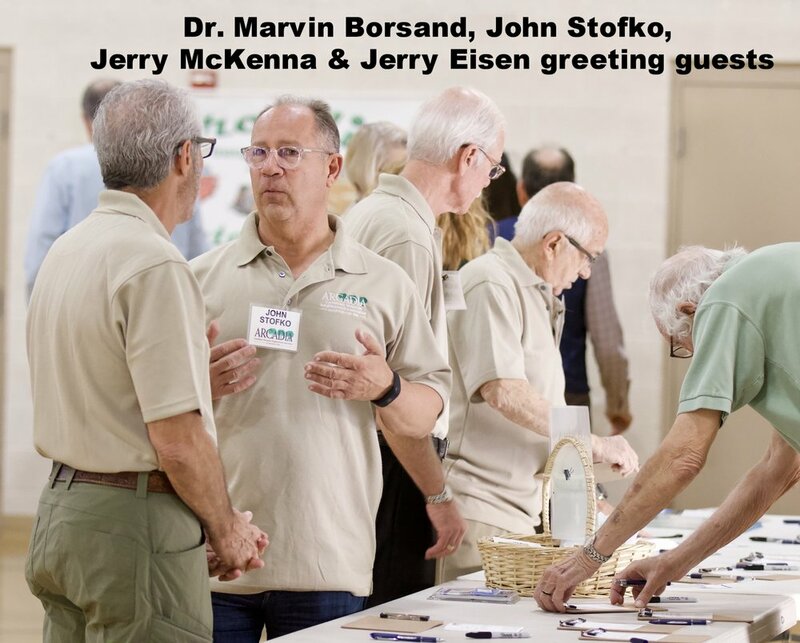 The event gave neighbors the opportunity to chat with one another, enjoy some breakfast and hear about the numerous projects the Association has been involved with in the last year. This year’s picnic was rescheduled to coincide with the first day of the Shemer Arizona Arts Festival. With well over 1000 neighbors in attendance, this is the largest neighborhood event ever (at least according to recent memory). The ACMNA provided hamburgers, hotdogs, soft drinks and other fare. Picnic-goers could also browse more than 40 displays of local Arizona artisans. Kids enjoyed bounce-houses, balloon artists, and other activities. The Dusty Tuffet Americana String Band kept toes tapping all afternoon. We’d like to acknowledge A-Z Equipment Rentals & Sales for providing a discount on tables and chairs. A donation by Mathnasium of Arcadia helped offset expenses. Special thanks to Officer Jared Sherman, who arranged for the Phoenix Police Special Assignment Unit to come out with an impressive display of gadgets and gear. He even spent some time flipping burgers! ACMNA Board Member, Brian Flader, led the planning and organization of the event. However, just important was the help we received from Wally Graham, President of AONA, and from Shonna James, President of the Shemer Art Center. First time's a charm. 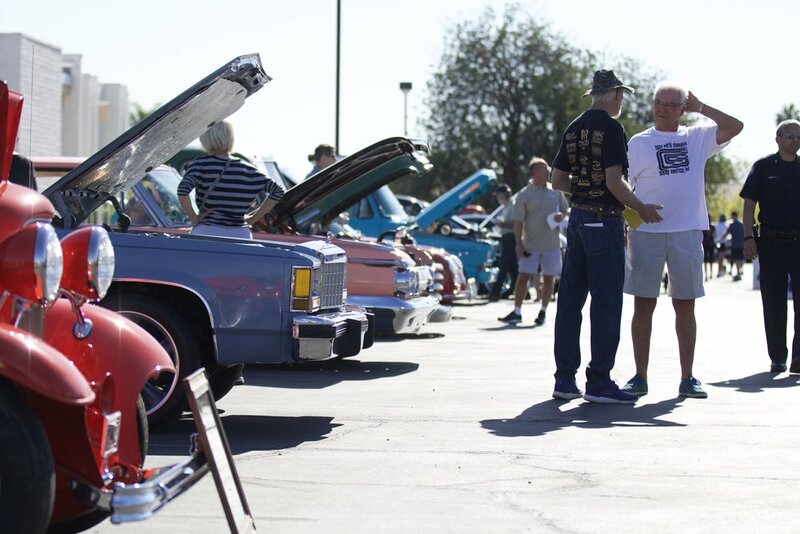 Over 250 spectators, lookers and exhibitors attended our first ever Arcadia Auto-Rama. 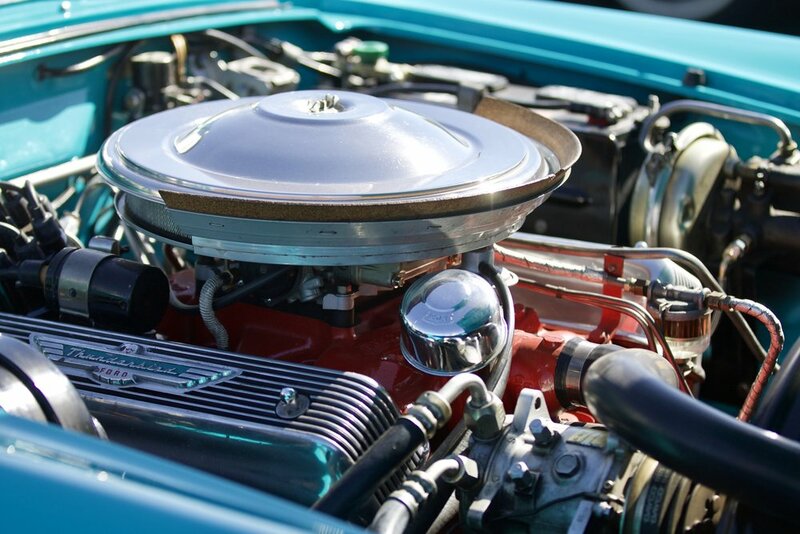 There were 52 vehicles on display including antique cars, classic cars, muscle cars, hot-rods, trucks and - a1971 Honda motorcycle. The Phoenix Police had their museum "Police Cruiser" prominently on display up front along with a 1908 Cadillac owned by David Dodge, one of ACMNA's founders. Special thanks to Jay Swart and Police Commander Anthony Vasquez for their diligence with the judging of "Best In Arcadia" won by Jack Nock with his 1932 Roadster. Almost 200 ballots were cast for the people's choice of "Best In Show" which was won by Tom Stewart from Mesa with his 1932 Sedan Hot Rod. Stay tuned for more great ACMNA events coming soon. Current Arcadia owner has owned the car since 1971. The car was bought with a school loan and was used as daily transportation for 10 years. In 1981 the car was totally restored to original. The original owner was the owner of the Porsche dealership at the time. This is not a kit, this is a 1915 frame, with a 1961 401 Buick Nailhead motor with a blower. All old school build. This 1908 Cadillac Touring car owned by David Dodge of Arcadia has been in the Dodge family for 110 years now. Ken Walker with his 575 horse power VW "bug"
1966 VW Bug Powered by a 575 Horsepower Chevy Engine. Designed and built by Owner to comply with NHRA 7.50 et. Specs. All round tube Cromemoly Chassis with Coil-over front and rear suspension. Competition 400 turbo Transmission with 4200 Stall Converter. Narrowed 9 Inch Ford rear. Estimated 1/4 time 9.83 Seconds @ 142 MPH. Bob Mason with his 1951 Chevy Pickup "rat-rod"
350 cubic inch Chevrolet; transmission is a GM 350 turbo hydramatic; differential is a Ford 8 inch; body is fiberglass; 4-inch dropped front axle; all leather interior; paint is two-stage urethane; lots of chrome. Nearly 200 neighbors met at Prince of Peace Church on Saturday, March 10, 2018. This was the 31st consecutive year that the Arcadia Neighborhood Membership came together to discuss neighborhood concerns and ideas with City and State officials and representatives. Rita's Italian Ice and the Balloon Man were only a small part of the fun, food and games enjoyed by our neighbors. Nearly 400 Arcadia neighbors gathered on Saturday, October 28th at the Shemer Art Center for a sunny afternoon BBQ and picnic to celebrate G.A.I.N. (Getting Arizona Involved in Neighborhoods). G.A.I.N. events are collaborative efforts among neighbors and first responders to promote awareness, safety and neighborhood unity. In that spirit, ACMNA teamed up with Arcadia Osborn Neighborhood Association (AONA), along with our local police and fire departments to host a free entertaining family-friendly event. Not only did neighbors have the opportunity to catch up with each other and our first responders, but were also able to meet and chat with State Senator Kate Brophy McGee, Phoenix Councilwoman Kate Gallego, State Representative Maria Syms, Councilman DiCiccio's Chief of Staff Sam Stone, Mt View Police Commander Anthony Vasquez, CEVPC Chairman Jay Swart and the ACMNA and AONA Board members. 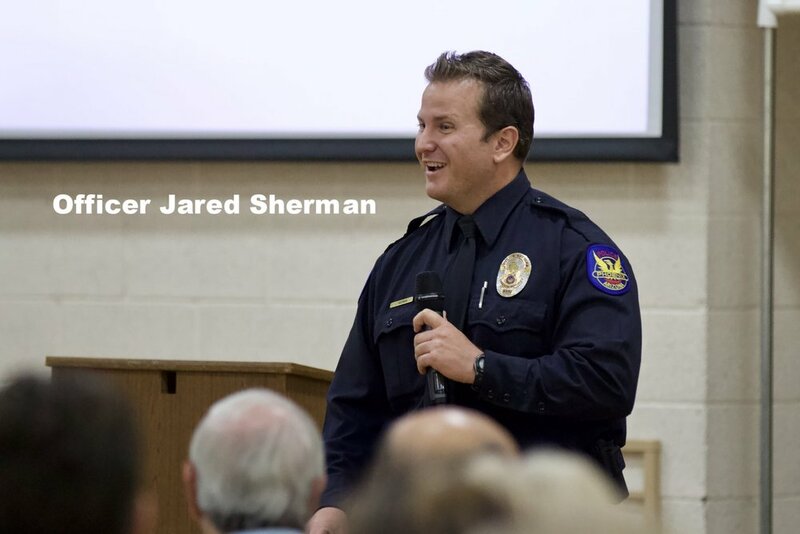 ACMNA board member, Brian Flader, who led the planning and organization of the event, credits the event's success to strong engagement of Arcadia's Police Department, Fire Department and the support of community stewards such as Shemer Art Center and SRP. We also very much appreciate our sponsors Rita's Italian Ice, Chick-fil-A, Phoenix Scaffolding, A to Z Equipment Rentals and SpeedPro Imaging. Officer Ben Carro along with Tim Moman showing off their grill skill. Yes, those are huge burgers and they were BBQ-ed to perfection. Sam Stone, Councilman DiCiccio's Chief of Staff also did a great job as the relief griller. With over 200 attendees, the 30th Annual Meeting was one of the best attended ACMNA events ever. Special guests included Phoenix Councilman Sal DiCiccio, Phoenix Police Chief Jeri Williams, CAO Police Officer Ben Carro. As well as many other Phoenix Department Representatives. AZ Legislative Representative Maria Syms (LD28) also made a surprise appearance. Special thanks to ACMNA Board Members Brian Flader and Tristahn Schaub for all their work in planning and conducting this event. Please thank our Meeting Event Sponsors the next time you visit their business. These local businesses provided over $2000 in door prizes for the Arcadia Annual Neighborhood Meeting. Please thank them when you visit their business. Have photos of your own to submit? Send us an email!